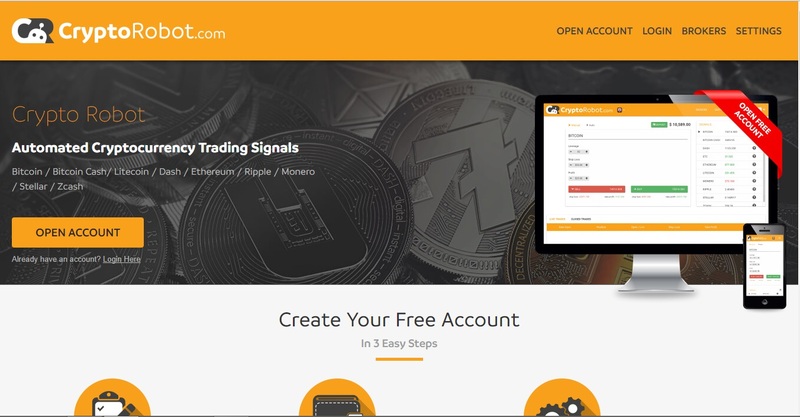 CryptoRobot.com – the Old Auto-trading Scam Strikes Again! As experienced reviewers dealing with scams and various far-fetched yet legitimate operations on a daily basis, we have become convinced that the old “get suckers to sign up to a scam broker through an autotrading deal, so you can collect commission off them” will NEVER die. It gets twisted and turned and dressed up into new clothes every once in a while, and it inevitably ends up served up to the most vulnerable and gullible of victims, taking advantage of various hype-trains. Today we shall take a look at one such deal – CryptoRobot.com. The hype-train that CryptoRobot.com is attempting to ride is that of cryptocurrencies, specifically Bitcoin, Bitcoin Cash, Litecoin, Dash, Ethereum, Ripple, Monero, Stellar and Zcash. Let’s make this clear from the onset though: this operation has nothing to do with cryptos in any shape or form (which would explain why no one has yet grassed it up at bitcointalk.org), and neither will you, if you sign up for the service. What it does is it gets users to sign up to various CFD brokerages, which may or may not trade cryptocurrency-based CFDs, in their names. If you know your CFDs, you also know that they are derivatives, meaning that through them, traders only cast predictions regarding the price evolution of an underlying asset. There is never any direct possession of cryptos. So much for the crypto angle. The reason we were left wholly unimpressed with the deal, following our very first glance at the site, is different though. Auto trading is a highly contentious issue. Few can pull it off, and those who do are unmistakably legitimate. Legitimate auto traders, such as GunBot (learn more in our GunBot Review), are extremely transparent, to the point of actually making the code available to the public. They never claim to accomplish more than the mere automation of someone’s already successful strategy. They cannot cook up strategies on their own, and they cannot “handle everything” in the trader’s stead. CryptoRobot.com is obviously not such an auto trader. What exactly does Cryptobot.com promise to deliver? The operation makes a rather reasonable pitch, in the sense that it does not dangle fabulous profits. The pitch focuses on a number of well known technical indicators and money management methods and that makes it almost palatable. At a closer look though, it is still unreasonable. Why would anyone make a service like this available for free? All of the above mentioned legitimate auto trading solutions cost quite a bit of money, and that makes perfect sense. After all, building proper auto trading software is not a cheap undertaking. Secondly, one of the money management methods peddled by the site is the Martingale. Gamblers know this “system” all too well and they’ll be quick to tell you what an absolutely faulty approach it is. The indicators dangled at the CryptoRobot.com site are the Trend Indicator, the MACD, the RSI, Williams, CCI and the Stochastic Oscillator. Every more or less experienced trader will tell you that these indicators are for technical analysis. Technical analysis is notoriously ineffective in the case of crypto currencies, the extreme volatility of which is driven by the fundamentals more than in the case of any other tradable asset class. Long story short: with auto traders such as this one, we always start off assuming that they are crooked – the statistical probability certainly justifies such an approach. We then look for clues trying to convince ourselves that they are in fact legitimate. We found nothing to support such a conclusion in CryptoRobot.com’s case. With the above in mind, the answer to that is an obvious no. Unfortunately, in addition to an utter lack of features indicating legitimacy, cryptorobot.com raises quite a few red flags too. First of all: the brokerages the site links to (to which their users are required to deposit) are unregulated ones for the most part. Opteck certainly is, and it seems to be the one where most of cryptobot’s registrants land. In addition to that, Opteck is also blacklisted by quite a few reviewers. Depositing your money with an operator like that, only means that you will never see your funds again. Thirdly, while the site does bring up a few indicators and settings for their auto trader, the transparency is this regard is just insufficient. We need to know a whole lot more about how the trading signals are generated, to be able to assess their efficiency. While there are a few negative reviews about cryptorobot.com out there, we haven’t found any user complaints yet, a fact possibly explained by the existence of scores of other similar scams out there. If one runs a search on CryptoRobot, he/she will be amazed by how many times the scam has been attempted through domain names like cryptorobot.software. Everything accounted for, it is safe to say that CryptoRobot is a highly suspicious operation – if not a straight-up scam. The operation makes use of a “traditional” scam recipe, it works hand-in-hand with highly disreputable brokerages, and its pitch just does not hold water. The methods it allegedly uses for auto trading are not feasible. It is free, and its creators are very keen on remaining unknown. Review Verdict: CryptoRobot should NOT be trusted! Do you have personal experience with CryptoRobot? Share your story with us by commenting below this review! Stay ahead of the crypto curve by subscribing to ScamBitcoin.com and receive our reviews and scam warnings directly to your inbox free of charge!